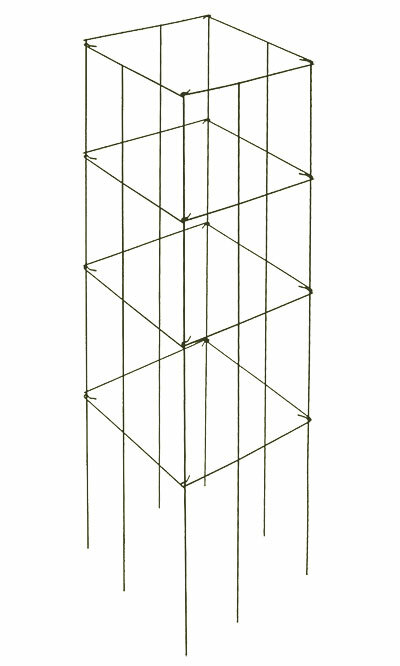 Help your tomato plants grow tall and strong with the Panacea Heavy-Duty 4-Panel Tomato Tower. This structure forms a square around your tomato plant, offering it support as it grows. Each panel connects to the next with a hook closure on each horizontal rod, keeping the unit stable and able to be moved easily as needed. The 13.75" square base may be placed in the ground, directly over your young plant, or placed in a 15" or larger square planter. As the tomato plant or small vine grows, it will naturally weave in and out of this metal cage for added support. This puts less stress on the plant roots, leading to a healthier garden. The metal construction offers a hardy, weather resistant accent that will last several seasons, and the green color blends with any leaves. Keep your garden beautiful and healthy with the Heavy-Duty 4-Panel Tomato Tower.